Government officials have confirmed than Egyptian business tycoon Naguib Sawiris will soon be investing millions into Grenada’s hospitality industry. Sawiris who flew into the island with his private jet on Wednesday, had discussions with Prime Minister Dr Keith Mitchell on Thursday at the VIP Lounge at the Maurice Bishop International Airport before departing. He is said to be the investor who will be building a hotel on lands which was recently acquired by Government on Grand Anse Beach. He is the new owner of the former Rivera and Silver Sands properties, and is in discussions to purchase the Grand Anse Campus of St George’s University. 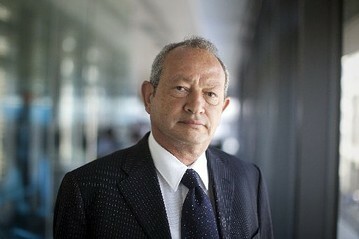 In an interview with the Wall Street Journal in August, Mr Sawiris who will be allowed to have citizenship based on the criteria established in the Citizenship by Investment legislation, said that his family plans to invest billions of dollars in Egypt after the ousting of Islamist president Mohammed Morsi. Mr. Sawiris, a scion of the Christian family that controls the Orascom corporate empire, is currently chairman of Orascom Telecom Media and Technology Holding, a large mobile operator in the Middle East. As one of the wealthiest businessmen in the Middle East, Mr. Sawiris founded the secular-leaning Free Egyptians Party after Egypt’s first uprising that toppled leader Hosni Mubarak in 2011. The investments to be undertaken by Sawiris are expected to be among the highlight of the Throne Speech which Governor General Dame Cécile La Grenade will deliver at the ceremonial opening of the second session of the ninth parliament next week Friday.